We're anchored off of a sparkling white sandy beach, on the other side of the bay from Georgetown off of Stocking Island. There are several other cruising boats anchored near us. On the island there is a small resort (St. Francis) and a bar where cruisers congregate and play beach volleyball. Apparently, in March of each year, hundreds of boats converge on this area and remain here for a month or more. I'm glad we're here now with just a few cruising boats. A couple of things I've not mentioned before - on one of our sails, we had play full dolphins swim along with us. They acted as if they spotted us and decided to come over and get some action from our bow waves. They swam with us for a several minutes, surfacing every few seconds along the bow. We've also had flying fish that hit the boat at night. In the morning, we find them dead on deck. Although they are tasty, we've not yet taken the opportunity to pan-fry them with a little olive oil and garlic. During the day, we see flying fish sail around in groups as the boat approaches. They skip along like they're having a lot of fun. Along the same lines as the email system, another nuance we have is a personal weather forecast. Dave signed up with the marine weather forecaster, Chris Parker. Each morning, Chris discusses all the weather patterns from the south east coast of the U.S. to the far south eastern Caribbean. Then, as a paying customer, or as he calls them "sponsored vessels", you can request advise on what the weather (wind and seas) will be doing according to your own personal itinerary. It appears to be a popular service and Chris seems to do a good job..This too has a big impact on today's cruising versus cruising years ago. Getting back to sailing. We left our Stockton Island anchorage in the afternoon, after getting a few more supplies, including a couple of six packs of Kalik, the Bahamian beer. We motored inside the reef for about an hour and left through the southern pass into the ocean. Lots of reefs and shoals all around us as we exited. A bit spooky, but we kept a good eye out and were right on the mark with the GPS. We headed to Long Island. This Long Island has no high rises and is worlds away from Wall Street. Since we had left a little late, we needed to keep up a good pace. With the jib up, we motored sailed at 6.5-7 knots. We got to our anchorage in Calabash Bay right at sundown - something that we prefer to avoid because it's more difficult to see coral heads and shoals when the sun is that low. It's best to maneuver in unknown anchorages with the sun behind you or above you. But we got in safely and anchored in about 20 feet of water. We've been using screens around the boat because of mosquitoes and worse yet - no-see-ems. These nasty little bugs can't be seen or felt until a day or two later. I woke up with 30-40 little welts on my legs and arms. And were really itchy!!! I suppose that there's always room to complain, even in paradise. We left Calabash Bay in Long Island at sunrise. The sun's glow silhouetted against the sprigly-looking vegetation on the stretch of beach to the east of us. There was little wind and the swells became more pronounced as we rounded Cape Santa Maria and headed for Rum Cay. The swells were long and low, creating a gentle roiling motion, that could have easily lulled me to sleep. About half way to Rum Cay, we saw Conception Island off to our port side. It would have made an interesting stopover because reportedly it has been kept pristine as a marine sanctuary. But also Rum Cay is reported to have good snorkeling and diving with a more secure anchorage and a small settlement. We arrived in Rum Cay later that afternoon and first decided to go snorkeling. The water was a crystal clear blue and warm - very inviting. We took the dinghy to the reef and snorkeled back with the dinghy in tow. Good exercise. We saw a variety of tropical fish among the elk horn coral, including parrot, clown, puffer, and various others. They mostly hovered around the big coral heads. Unfortunately again we were unsuccessful in finding good sized conch shells. I found one medium sized one, but we put it back. We took a quick look at the village of Port Nelson but weren't overly impressed. Only a hundred people reportedly live on the island, so it is a very small community. The Sumner Point Marina was at the east end, but it too looked forlorn. We resorted to the most logical strategy - we headed back to the boat, had a round of cocktails, fixed dinner and relaxed for the evening. The wind freshened during the night. We put out a little more anchor rode and went back to sleep. In the morning we were awakened to rain. It turned out to be a series of squalls going through the area. In a while the weather subsided and we pulled up anchor. We headed for the southeast end of Long Island, to the small town of Clarence Town. Due to the direction we were headed (SE), we typically had the wind and sea on the nose. Unfortunately, to make any headway under those conditions one needs to motor sail. This has often been the case. Had we started out with a boat in Trinidad, we could have sailed with the wind and seas all the way to Florida. The words we now use to describe our sail are "clawing, slugging it out, getting pounded" just to name a few. Christopher Columbus left his tracks on a number of these islands. On December 5, 1942 he discovered the island of Hispaniola (today the Dominican Republic and Haiti). Here in the Bahamas, several islands also tout of being a place where Columbus left footprints. But some vie for the distinction of actually being the first place he stepped ashore. Of course with that comes numerous legends, claims and counter claims. San Salvador, Egg and Samana are among those islands claiming to the honor. We bypassed San Salvador and Egg Island and have yet to go to Samana. Long Island simply claims itself as one of the islands Columbus visited. We noticed on the charts, that we are now officially into the Tropic of Cancer - 23 degrees and 27 minutes north of the equator. The significance of that is that we are now officially in the tropical belt. It feels like it. The temperature has been ranging in the low 90's with a fair amount of humidity. At night the temperature is not much different. I sleep in what I wear all day - a bathing suit and no covers. We arrived in Clarence Town, Long Island at 4:30 pm. It looked like a nice place but all we wanted to do was go for a swim to cool off and feel refreshed. We didn't want to go through the burdensome drill of getting the dinghy off into the water and setting up the outboard. After all, the plan was to leave first thing in the morning for Crooked Island. After the swim, we had a glass of wine and watched the sunset, while planning for the next day's adventure. Today is Meredith's 27th birthday. Wow, these kids sure grow up fast!!!. We're at an anchorage in the southern part of Long Island called Gordons Beach. Our day started out with the objective of making the western end of Crooked Island. But once out at sea off of Clarence Town, it became quite apparent that we weren't going to be able to make the southeastern course. The seas were relatively high and the wind was a steady at 15+ knots with gusts up to 25 knots. We looked at the charts, reviewed our options and decided to go south along the coast of Long Island. Good decision. By mid-afternoon, we were anchored in 15 feet of sand, at a beautiful beach, albeit, a bit rolly. But the wind was blowing offshore, making the Gorgon's Beach anchorage a relatively safe one. We got the dinghy out and set towards shore to explore the deserted beach. We were the only sailboat in the anchorage. 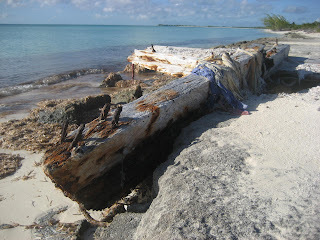 Probably the most interesting find on the beach was the remains of a wooden vessel. Strewn around too, were lots of shredded clothing articles and shoes. We ventured a guess that the boat had been carrying the clothes to give to local poor Bahamians. Unfortunately, it never got to them. After getting back to the boat, we swam around to cool off. I found two good sized conch shells that we brought aboard. They were beautiful but looked different from the ones we normally saw. They had more browns and shell was shaped more flat at the opening (ear). We worked hard at getting the muscle out of one of the shells. But all we managed to do was to create a smelly, ooze of goo. Something seemed amiss. Unfortunately, we ended up throwing them back into the sea. 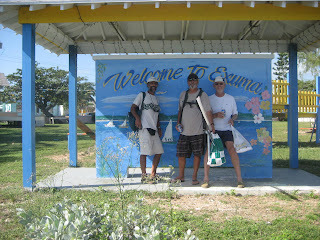 (A few days later we talked to a Bahamian and told him of our experience. He said "Oh, those are either the King or Queen Conch - they're not eatable and can be poisonous.) Pheeww!!! Sometimes it's good not to be too persistent! Later, Dave worked on an anchoring technique that is supposed to mitigate the actions of the swells when they come from a different direction than the wind. By attaching another line to the anchor line and running it back to the stern of the boat, the idea is to point the boat into the oncoming swells instead of the wind. It worked a little, but I think that Lahaina Roads has too much freeboard causing her to sail around a bit at anchor. There was no way to keep her solely positioned into the swells. We had to put up with the rocking and rolling. We knew we had a rough sail ahead of us from Long to Crooked Island, so we got up at 6am to prepare. Crooked was directly east and into the wind and seas. The seas are not particularly huge (perhaps 6-8 feet on average). But when you're fighting both wind and sea, you only make marginal headway and it's a continual pounding as the boat launches into each swell then dips the bow into the following one. It's tiresome. As we got under way from the anchorage and rounded South Point, the southern reef of Long Island, we decided that we'd head further south before attempting an eastern tack. After several miles southward, we made the tack eastward. Incidentally, this again is all motor sailing. We couldn't make much headway at all, if wasn't for the iron spinnaker (engine) pushing us through these confused seas. Columbus was smarter - when he was sailing through this area, he was going the other way towards Florida! We got to Landrail Point, in Crooked Island at 3:30pm. We anchored and went through the dinghy drill (into the water, lift motor into it, gas tank setup, oars, etc). We took a surprisingly fun walk around the Landrail settlement. We were greeted by a young fellow, Randy, who worked at the local resort as a bonefish guide. As we walked, everyone stopped to say hello and asks how we were doing. Very friendly folks. We met at elderly lady, Marina, who had lived on Crooked for 47 years. She had a small restaurant, Gibsons, with one big table in the center. No customers, but she didn't seem worried. A little about bonefish. Fishing for bonefish is popular here in Landrail. The fish are not meant to be eaten - they are a favorite of fly fishermen to catch and release. The word is that they are much feistier than trout, giving a good fight from the moment they take the bait to the very end. Sportsfishermen fly into Landrail and go bonefish fishing. That's the deal. The next morning, we were underway to Ackin Island by 7:30 a.m. From the looks of the chart, Acklin and Crooked Island at one time probably were one island. But today they are separate. We sailed along the northern coast of each of the islands moving eastward. It wasn't easy. With 15-20 knot winds and 8 foot seas on the nose, it was our usual fight for every inch of ground. By 3:30pm though, we were snug in Atwood Harbor. It was simple to get into the harbor. Once in, it looked very protected from all seas but from the north. A big plus of the anchorage was that it was smooth with no swells. We were tucked in behind the reef. Once anchored, I got out my snorkeling gear and set out to look for conch shells. If any place had a chance of having conch, this remote place would have them. I swam to shore, keeping a look out for them. Nothing! The water was a bit murky but visibility was not bad. I was getting close to shore and had nearly given up on looking for conch when I ran into a bunch of them. They weren't the real big ones, but certainly of eatable size. I walked all around the beach and then swam back to the boat. Dave had been working on a fuel line from one of the tanks to see why no fuel was coming out of it. But it looked clean. I drew his attention to the fact that I had spotted conch shells near shore. That looked a lot more interesting than fuel lines, so we got the dinghy in the water and headed to the spot. We ended up picking up only two of the larger conch shells and set about to get the muscle out. From what I recalled 30 years ago, from the outside of the shell, you count one and a quarter turns inward and with a screw driver, hammer a slit wide enough to get a butter knife into it. If done correctly, the muscle then slips out of the shell. It did take us a few tries. But eventually we got the muscle to come out of the shell. We took our "bounty" back to the boat and later cooked the conch with garlic and added that to a ready-made mac & cheese. Together with a salad and a fine box of cabernet savignon, that was dinner. Tasty! We left Atwood Harbor at our leisure in the morning. Our next sail was a short twenty mile hop to West Plana Island. We made a few tacks and by 2pm approached the white sandy beach of West Plana and anchored in about 15 feet. Our plan was to stay long enough to have dinner and a short rest, then at 11pm leave for Mayaguana. The strategy would get us into there early in the morning, within the weather window of decent wind. After that, the weather report bore news of thirty knot winds with potentially higher gusts, all coming from where we wanted to go - naturally! All went according to plan. After brewing a fresh pot of coffee, we pulled up anchor at 11pm. We hoisted the mainsail and didn't bother with the jib. We were going to motorsail and point as high as we could to get our easting. As we rounded Devil's Point in Mayaguana, we noticed the wind and seas pick up. Soon we were punching into to strong seas and winds over 21 knots. Some of the oncoming seas would bring the boat to a near stand-still as the bow unleashed a torrid of spray. It took over an hour to make it inside the reef. We approached with caution, since the charts reported several coral heads and rocks. Although the GPS is very useful in these areas, visual piloting rules (VPR) apply - that means someone keeping a lookout from the bow (since we have no crow's nest) for shoals, rocks and coral heads. Mayaguana is our twelfth and last Bahamas island. Abraham's is not a typical anchorage. The barrier reef is nearly a mile from the land. With it blowing nearly 25 knots (from the sea), it actually is better to go to tuck in right behind the reef. So here we are - it looks like in the middle of nowhere, anchored near breakers (on the other side of the reef), with land visible far away towards shore. But we're in only twelve feet of crystal clear aquamarine colored water. We were having a beer, when we spotted a small boat fishing. It turned out, what they were really doing was diving for conch. After a while they came near to us and so we flagged them down. We ended up buying six cleaned conch for $10. Probably too much, but as blustery as it was, snorkeling far from the boat was not in the making and we wanted a conch dinner. The conch ended up being plenty for two nights. The clanging halyards forewarn us of a squall's approach as they hit the mast with an ever quickening beat. And that's good information. But we found an even better alarm in the GPS. It can warns us if the anchor is dragging. All we need to do is set a warning such that if the boat moves more than one tenth of a nautical mile from our anchored spot, the alarm sounds. That's really good information and hopefully would be loud enough to awaken us in the middle of the night. Having found out in Marsh Harbor that our anchoring technique was not flawless, this function likely would have helped. We have yet to make the move towards the Turks and Caycos. Perhaps tomorrow. Strong winds, squalls and seas continue to keep us hemmed in at Mayaguana. Yesterday, we got a brief respite from the wind, allowing us the opportunity to take a long, wet and bumpy dinghy ride to the settlement at the eastern end of the bay. There wasn't much there but a customs and immigration office, a grocery store and some houses. At the small grocery store we bought a few bananas and oranges (from California). But on the way back to the dinghy, we got lucky and met some fishermen cleaning fish, conch and lobster. We successfully negotiated for a couple of nice lobster tails. Dinner was very tasty indeed. December 16 - I think we can make a run for it! In the morning we listened to Chris Parker, the weather guru. Sounds like we can make a run for the Caicos. The plan that we have is to leave here before noon and get to the eastern part of Mayaguana. There, we anchor for the evening, have dinner and rest (not unlike the West Plana trip). Late at night, we then sail off for Caicos. But as the scene unfolds....We pull up anchor and motor towards the channel to get out of Abraham's Bay and guess what - the RPM's on the engine slows up right in the middle of the channel. Dejavu! Dave jumps down the companion way to check the engine. This time it was an easy fix - the cable for the throttle got loose and caused the problem. Off we went. We were another twenty minutes out when the engine suddenly died. Again, Dave went down below to check - keep in mind that when he's working around the engine, the boat is rocking back and forth. And the engine's surfaces are smoldering hot! A wrong move and you quickly smell roasted flesh! This time, the reason that the engine stopped was due to no fuel coming out of the main tank. The familiar problem again was haunting us. Dave switched to one of the other two tanks we had and the engine roarred back to life. We motor sailed to the eastern end of Mayaguana. 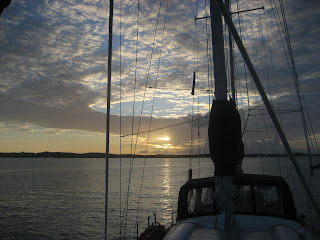 But by the time we neared the anchorage, we had changed our minds about anchoring for a few hours. We decided to keep on sailing towards the Caicos, Not to arrive at night, the plan was to slow the boat down by putting up less sail. Altough the technique worked to a point, it didn't slow us up enough because the winds increased from a mild 12-14 to a brisk 20 knots. To counter our fast progress we tacked northeastward for a few hours. Sailing NNE also resulted in a better point of sail to Provo (Caicos). We even managed to get some shuteye on the way. In the morning we were near the entrance of what's called the Sandborne Pass. 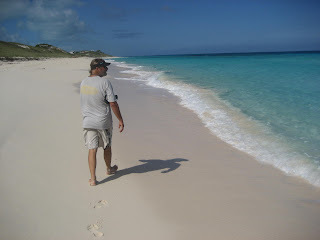 It still took us a couple of hours to navigate through the channel in the Caicos and into the harbor area. Once there, we called for Customs and Immigration on the VHF channel 16. They didn't answer. Who did answer was the marina further east. In a very proper British accent, a gentleman by the name of Simon, listed the available options on how to reach customs and immigration (including where to anchor, how to go ashore with the dinghy, and how to find their office). He also gave us another alternative - we could come in and dock at the marina. He would then call for the Customs and Immigration people to clear us in from the marina. That was all too tempting. We went for it. Simon was superb. After we told him that we would like to come to the South Side Marina, he gave us very detailed waypoints and specific direction around the local buoys to the marina. Not long afterwards, we were docked at the marina. Simon and his wife, Charlyn, are truly welcoming people. They run the marina for the owner, Bob, and are former cruisers (still living on their boat). They took us all around the island - shopping, banking, airport, wine store, marine parts store etc. In the evening the cruisers met at the main dock for happy hour. It was a nice way to finish off the day.